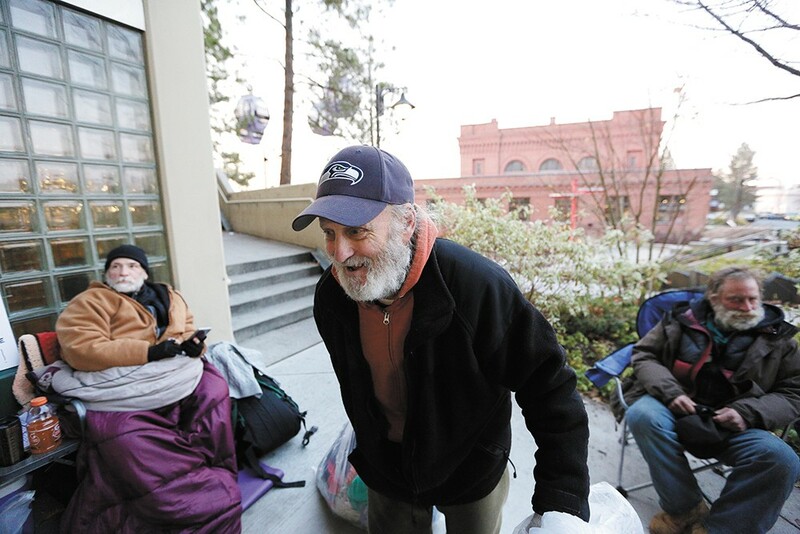 James Welch gathers donations from City Hall to pass out to those in need. On the first Saturday night in November, Creighton James Welch (call him James or "Craty") pulls his blue rolling cooler filled with supplies behind him as he shuffles into the Spokane Transit Authority Plaza. He sets up in a corner, pulling out bananas and loaves of bread, arranging things on a nearby garbage can and the floor until he can close the cooler up and use that as a work surface. "I mix the strawberry and grape jelly in the jar with the peanut butter because it spreads better," he explains as he hunches over to start fixing up four or five loaves, moving slowly but steadily. Homeless people keeping warm in the downtown bus terminal start to come over, quietly taking sandwich after sandwich. Some come back two or three times. Some say thank you. Others ask if he has chips. "They can't leave their stuff to go to meals," Welch says. "So I'll give 'em a couple if other people have already had one." Welch asks if they'd also like gloves or socks — he's put together goodie bags filled with hats, gloves, socks and clean underwear that he bought at a dollar store. When a young girl shyly asks, "Are you the sandwich person?" he gives her food and a bag of feminine hygiene products. The blonde girl, wrapped in a blanket, says she's 20, though she looks much younger. She says she's homeless by choice because she likes to travel with her boyfriend, and because her mom has other kids to care for. "I don't want to go take from her more than I already have," she says. Welch, who keeps tabs on Spokane City Council and local news, strongly feels the city isn't doing enough for the homeless. So since about July, he has been helping people like this as much as he can. He wanders downtown handing out food and jugs of Powerade. When he finds out someone needs a tarp, a jacket, a sleeping bag, he tries to find them one before his next trip. Welch initially reaches out to the Inlander in hopes he can connect a writer with some of the people he helps. Maybe, he thinks, sharing their stories could show others the realities of homelessness. "It dawned on me, 'You have time, and your stuff's safe, so get out and help people.' So that's what I'll do." Thing is, Welch himself is also homeless. He's been in and out of it since 2010, and since this summer, he's been living under a lean-to made with a tarp, sleeping on an air mattress on the ground. Recently, he's been able to stay in a run-down travel trailer, but that situation won't last. Still, he feels luckier than most homeless folks, because the spot he has is secure. "My nephew wants me to go stay with him [on the west side]," Welch says. "But I kinda got the bug for helping people. It dawned on me, 'You have time, and your stuff's safe, so get out and help people.' So that's what I'll do." As soon as he gets his roughly $700 Supplemental Security Income on the first of each month, he buys things to give out. Between that and the chunk taken out for the payday loans he's been using to get by, he's sometimes penniless within days. "When I hit Walmart the other night, I spent 90-something," Welch says at the plaza on Nov. 3. "I probably spent enough that I'm close ... but these guys need it." Before heading home, he checks his bank account to find out it's already overdrawn. But if the city won't do more for these people right away, he says, someone has to. He's not a saint, he says, just a good samaritan. "There's just no sense of urgency with those people," Welch says later. "The last couple weeks there's been a couple nights it's been so cold you coulda froze to death or at least died from exposure, and they decided to wait for another month to even discuss letting people hang out during the day at City Hall. I mean, it's crazy." At the trailer where Welch has been staying, he shows off his hardwood collection, mostly branches he's asked to cut from people's yards. He carves pipes and jewelry to sell, and hopes that could be his ticket out of this situation. "I got a plan," he says. "I'm not just gonna decide, 'Well, this is it, I'm stuck with it.'" Born in Seattle, Nov. 25, 1949, Welch grew up in North Dakota, British Columbia, Arizona and Montana, before landing in Spokane in the mid-'60s. James Welch talks to John, who says he has been homeless for the past five of six months. He did odd jobs over the years, including a short stint at Kaiser Aluminum that wore his body out. He married and had three sons in the '80s, but after a divorce, the kids and his ex moved to the west side. It's been years since he's seen them. Welch says he recently found out one of his sons has been missing, apparently living on the streets addicted to drugs. He's not sure if his little sister is still in Spokane — it's been 30 years since they spoke — and his other relatives are spread out. Welch says he first became homeless around 2010 after his legs were severely burned in a space heater accident, and he had some small strokes. "I think stress caused that," Welch says of the strokes. "That, and lighting the candle at both ends drinking and stuff." After another apartment didn't work out, he wound up on the streets. He lived in a garage for a few years, but after the friend letting him stay there died of a heart attack, Welch again found himself outside. He says it's mostly OK. His lean-to keeps him dry. "You know, I really don't mind it," Welch says. "I used to go up in the mountains and stay for weeks at a time, cutting wood and exploring and looking for neat places. So I'm used to being outside a lot." Of course, it'd be better to have a real place. But with his small income, he's priced out of the market, and low-income apartments often have waiting lists or they're too far by bus, he says. So while he gets his woodworking in order, and waits to hear from the lists he is on, he's put his efforts toward helping where he can. On Monday, Nov. 12, the Spokane City Council unanimously approved some homeless service ordinances, accounting for homeless outreach funding, accepting $11,000 in donations to the Give Real Change campaign and allocating more than $296,000 to pay for warming shelters. The two warming shelters funded with reserve money will temporarily expand space for households with children to stay at the new Open Doors shelter at the former Cassano's Grocery building and enable Hope House overnight shelter and Women's Hearth day shelter to serve adult women all week. Still, the council hasn't been asked to approve an option for adults who don't fall in those categories. Those adults would have qualified to stay at House of Charity before it reduced its capacity by about 100 spaces in September, after the 24/7 shelter experiment was ruled a bust. The city is working on a solution, but it's not ready yet, says Kelly Keenan, the city's director of community housing and human services. Unlike previous warming shelters, the network the city is working to develop this year won't open only when it drops to a certain temperature. "This year we are planning for nightly operation regardless of temperature," Keenan says by email. "We will keep pushing until we have a network of sites that provide safe/warm capacity for this winter season." In the meantime, the city is holding a donation drive to collect clothing, sleeping bags, coats and more. On Nov. 14, Welch arrived at City Hall to pick up some of the donations to hand out. Councilwoman Karen Stratton happens to walk by on her way to talk to Alfredo LLamedo, who is on a hunger strike outside to protest the city's sit-lie ordinance for targeting homeless people. She says hi to Welch, who wants to meet with her to discuss homeless solutions. Like Welch, she thinks everyone has to pitch in for things to change. She recently helped a couple living in an alley behind her mom's house. All it took was helping them call family and friends. "It really is taking that next step, and if you're not afraid, to talk to them and find out what they need, if there's somebody you can call," Stratton says. "I think it's gonna take all of us." Soon, Welch stacks two huge garbage bags of donated clothes on his rolling cooler, and lugs bags of coats and socks with his free arm as he makes his way to his usual spot at the plaza, where people sit charging their phones. Twenty-five-year-old Alec tries on a black leather jacket from the stash, and it's a perfect fit. He says he's been homeless for about a year and a half after he got a DUI and lost his pizza delivery job, and his rental situation went awry. "In people's minds, we're not human. ... I mean really? Four walls define me as a human being?" With a bleeding disorder that regularly lands him in the hospital, he knows living on the streets isn't healthy. From Spokane, he says his family is reluctant to help because they don't think he's helping himself enough right now. But when you're living hour-to-hour it's harder to get things done than it might look from the outside, he says. "They want me to get a job or apply for housing," he says, "but a lot of days, I'm just trying to survive." Nearby is 59-year-old Debra. She's been homeless for about nine months, after losing her job as a server, then losing her apartment. "In one month my life went to hell," she says. "Most people don't realize, the bank owns them. They're this close. ... My whole life I worked. I raised my son. I wasn't on welfare. I was on the PTA and everything. I was normal." But since living on the streets, she says she's been treated like vermin, being shooed out of doorways, and harassed by people taking photos for Facebook groups meant to shame people they assume are "tweakers." "I had a woman spit on me and call me garbage," she says. "In people's minds, we're not human. ... I mean really? Four walls define me as a human being?" Farther away, Welch hands out most of the clothes and bags of food to a large group that has spread their things out along a tunnel under the train tracks downtown. 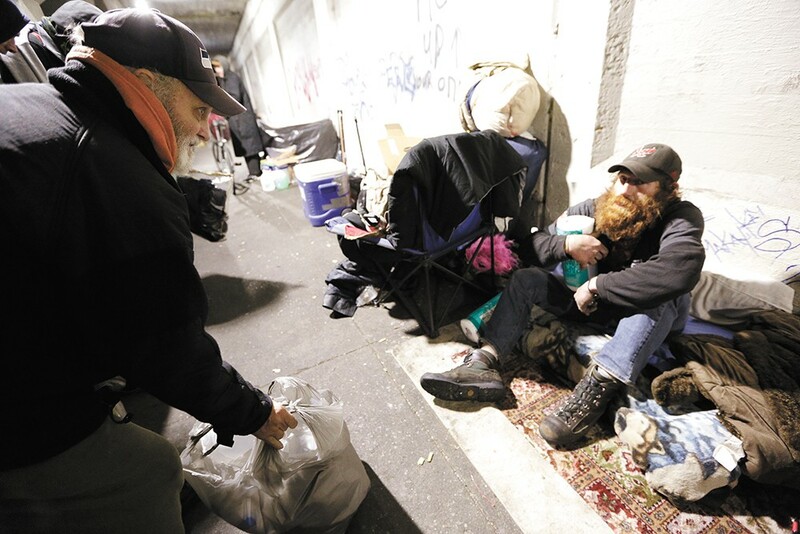 "Guys like this that pay it forward, if everybody helped more like that, it'd be less helpless, less hopeless," says Jason James Trampush, one of the men standing under the bright lights in the concrete tunnel. "He's a stellar part of the community." Welch stays out late again, and when we talk the next day, just 10 days before his birthday, he's down to $1 in his account again. He believes in good and bad forces in the universe. So far, he says, whenever he's really needed help, someone shows up at just the right moment. Hopefully, he says, that'll happen again. The original print version of this article was headlined "Giving it All"